Getting there: As the name suggests, this hotel sits near the Queenstown waterfront. It’s less than a 10-minute ride from the airport — but be careful of that: We travelled with someone who reported paying north of $50 for a cab from the terminal to the hotel, on Earl St. Outrageous. Check-in experience: Swift. The valet service had our car (Ha! Screw you, $50 cabbies) whipped away by the time we’d wandered up to reception. We were key-carded and facility-wisened within minutes. Impressive, as we’d come in on a Friday afternoon, when the resort town starts to burst at the seams. Along with the check-in desk and concierge, there are a couple of desks in the foyer for booking activities. Room: We were in 421, a Lakeside Twin Room with two double beds and a balcony looking out on to a park on Lake Wakatipu’s foreshore. A sound resting spot for a couple on a ski-break weekend, or — as we were — overnighting before heading to Milford Sound first thing in the morning. What’s in the neighbourhood? You’re about a one-minute walk from Queenstown’s eateries. 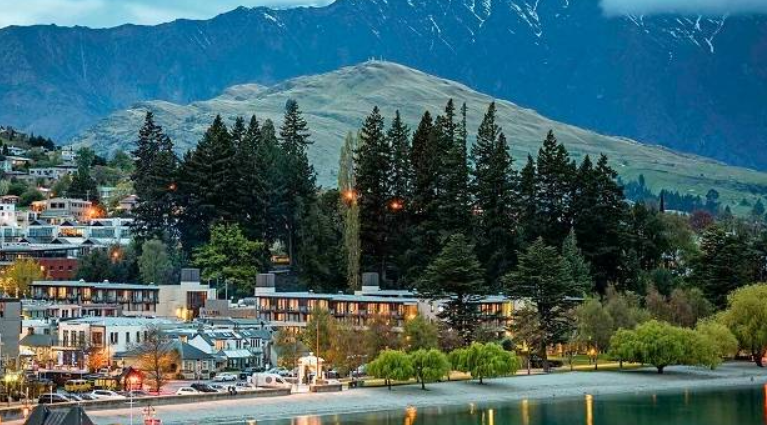 The compact nature of central Queenstown makes for a dog of a traffic situation by day, but come the night (when the cars have gone to sleep), there’s a pleasant village vibe and loads of great bars and restaurants. Bathroom: No complaints on the key shower pressure front . . . and our room was as far from the building’s hub (and central plumbing fixtures) as you could get. Food and drink: There’s a restaurant on site but we went to Josh Emett’s Madam Woo for an Asian-inspired meal, the inspiration for which we could have in Auckland for half the price. Nice mocktails, however — making one night of Dry July bearable. Noise: Not a peep. Quite an achievement, given the proximity to the resort town’s bars. Exercise: There’s a small gym room with treadmills, bikes and rowers, but if you want to work up a sweat, you should head out for a lakeside jog.